Straight Baffle for 6-inch Recessed Housings This straight white baffle has a larger interior, allowing higher wattage bulbs to be used. 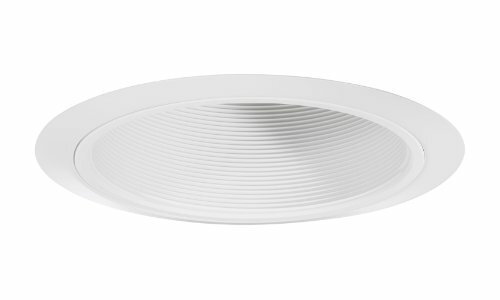 The outer white trim ring has a gradual slope, allowing it to fit flush with the ceiling. Springs are included for a tight fit. Takes a maximum 90-watt PAR38 bulb (not included). Wet location approved when used with outdoor rated lamps. 7.62 in. Juno Lighting Group Straight Baffle For 6-Inch Recessed Housings - White Plastic Ceiling Light Fixture - 7.62 In.